Let's get real here. Spring cleaning usually isn't at the top of - OK, really even on - most of our lists of priorities. Our lackluster enthusiasm for cleaning is understandable. You'll need the right cleaning tools to spring clean effectively without harsh chemical cleaners. Do you know anyone who turns cartwheels at the prospect of diving into corner dust bunnies or mopping up pet piddle from the living room chair? Me neither. 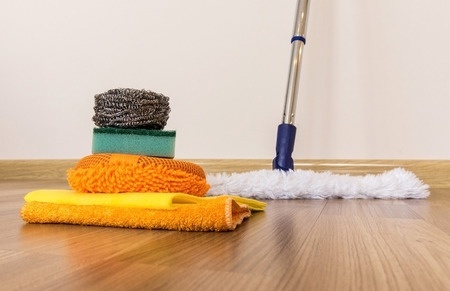 Which raises the question of the proper cleaning season: Does spring cleaning - that traditional rite of home purification - still have a place in our cleaning-challenged lives today? Well, sort of. As a modern mom of three very busy kids and two perfect cats (except for the fact that they shed year-round), I'm all for a clean house that's a healthy environment for my family to eat, sleep, chase catnip and chase each other in. Cleaning without chemicals is always a safer option. I have an aversion to the whole-house, blast everything with hazardous cleaning products type spring cleaning. So I've compiled this guide for spring cleaning without chemicals. Dust happens. This gadfly of the dirt world is anything but innocuous. Dust is actually composed of just about everything you don't want in your home, on your stuff, or in your family's lungs: tiny particles of sawdust, fabric, paper, carbon from smoke, flakes of skin, little pieces of insects. And if left to settle in bathrooms and the kitchen, dust quickly morphs into grime. The moist air in those rooms provides the perfect breeding ground for grime and worse. And since grime and its dirty sister, mud, can require stronger, often hazardous cleaning products, dust is the cleaning task to tackle first this spring - and throughout the year. Vacuum cleaner with dust attachment. Use the attachment to reach beneath furniture or appliances and into far corners. Electrostatic dust cloths, which attract and hold dust with static electricity. These cloths can be washed and reused. Lamb's wool (natural) duster, a cotton-candy shaped puff of wool on a stick. The lamb's wool's natural oils work with static electricity to grab and keep dust. Dust mop. It's better than a broom as it traps and holds fine dust better. You'll need to treat the dust mop first with an oily or waxy compound designed to grab and hold dust. Final dusting tips: don't dust with a damp rag. A damp rag plus dust equals mud. Worse, you can end up smearing the grime around and leaving streaks where you're trying to clean. Choose a good, reusable dust cloth instead. Clean cloth diapers work great, too. Big-ticket items like furniture and upholstery should be dusted and vacuumed regularly, and given extra cleaning attention come spring. It's the only way to control the airborne cooking oils and dust that inevitably settle on these surfaces. Blot on a small amount of rubbing alcohol. Repeat until there is no more transfer of stain to white cloth or plain white paper towel. If stain is gone, stop here. If not: Blot with a solution of 1 teaspoon dishwashing liquid or laundry detergent and 1 cup water. Work from outside of stain toward center. Rinse with damp sponge to remove detergent. Blot dry. Rinse with solution of 1/2 cup vinegar and 1/2 cup water. Blot dry. Brush when fully dry to restore texture. Blot with a solution of 1 teaspoon dishwashing liquid and 1 cup warm water. Blot and repeat. 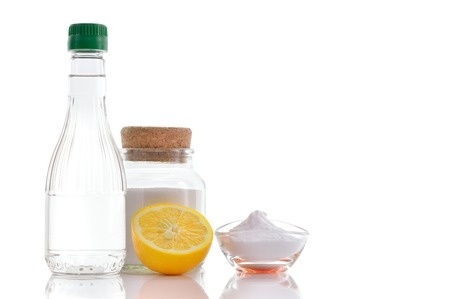 Rinse with vinegar solution of 1 cup white vinegar and 1 cup warm water. Blot dry. Brush fabric when fully dry. Blot milk and other dairy spills with a small amount of dry cleaning fluid and blot dry. Repeat until no stain transfers to paper towel. Wet fabric slightly and let set, damp, about one minute. Blot with a paper towel. Repeat until no stain is evident on towel and blot dry. If stain is gone, stop here. If not, rub in a detergent solution of 1 teaspoon dishwashing liquid and 1 cup warm water. Repeat until no stain transfers to towel. They're our best friends, and sometimes our worst enemies (for a split second anyway) after we discover piddle on the living room rug or feces on a favorite chair. You don't have to live with their pungent reminders. These stains and strong smells can be removed, especially if you catch them when they're still fresh. Clay-based clumping kitty litter to absorb odors. If that doesn't knock out odors, clean out the cat box with 1/2 cup of vinegar. First, soak up as much as you can with a white rag or paper towels. Blot on a solution of 1/4 teaspoon mild laundry detergent and 1 cup warm water. Repeat until there is no more of the stain transferring to a towel or rag. If that doesn't work, try: Blotting with a solution of 2 teaspoons ammonia and 1 cup water. Rinse with warm water. Repeat. Blot dry. If that doesn't work, try: Blotting the area with a solution of 1 cup white vinegar and 2 cups water. Rinse. Cover with several layers of paper towels weighted down with a heavy, non-fading object. Continue changing paper towels until the carpet is dry. Gently scoop away excess with a spoon or spatula. Blot with ammonia solution (see solution above). Let it soak for several minutes. Blot, and repeat until the stain is removed. Rinse with cold water. Blot dry. On carpet, use a vacuum with a good beater brush or brush roll. Regular vacuums don't generate enough suction to pick up all the pet hair from the carpet. Or rune a squeegee over the area. Just swipe it over the carpet and watch it cling to the brush. Use a pet rake - a special brush with crimped nylon bristles - on upholstered sofas and chairs. Use light, even strokes to remove the fur. Velour brushes, tape rollers, and even tape wrapped around your hand will also work. Final tip for pet messes: Avoid using steam cleaners to clean urine odors from carpet or upholstery. The heat will permanently set the odor and the stain by bonding the protein into any man-made fibers. Here's to a greener spring cleaning without chemicals!